Ubiquiti Unifi Cloud Key UC-CK Hybrid Cloud Device Management Featuring Hybrid Cloud technology, the Ubiquiti Unifi Cloud Key UC-CK securely runs a local instance of the UniFi Controller software and features cloud Single Sign-On for remote access.The UniFi Cloud Key combines the best of local and cloud management: local network security combined... more with convenient remote access.Powerful Quad-Core ArchitectureThe Ubiquiti Unifi Cloud Key UC-CK provides top processing power for centralized device management.Plug and Play InstallationInstant setup: connect the Ubiquiti Unifi Cloud Key UC-CK to 802.3af PoE and run the UniFi Controller setup wizard. note: MAGNETIC FEETS as accessory on the booklet are not included. Ubiquiti UVC-NVR is a plug-and-play NVR appliance with low power consumption. The airVision software is pre-installed for quick and easy installation. No additional software is required. Plug it into the network, go through the configuration wizard, and it is set up and ready to... more go. The airVision NVR has a built-in 500 GB hard drive. This equates to approximately 1200 recording hours @ 480p resolution or 400 recording hours at 720p resolution (these can vary depending on the frame rate). 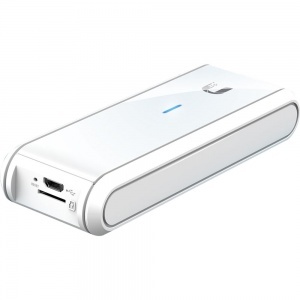 For additional storage, connect USB 3.0 hard drives or network storage devices. Event Recordings airVision gives you a variety of options and settings to customize what your cameras record. Detailed Statistical Reporting Quickly assess important camera activity and NVR performance with easy-to-read graphs. Advanced Analytics Customize your own motion detection zones. You can place several zones and set their alarm sensitivities as high or low as the situation demands.